Click the photos for better quality images. Want some free stickers? 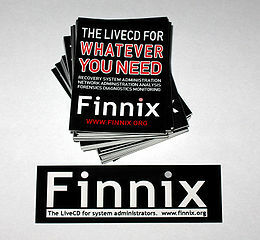 The long Finnix stickers are 4.25" x 1.38", white on black, and the squarish stickers are 2.13" x 2.75", red and white on black. 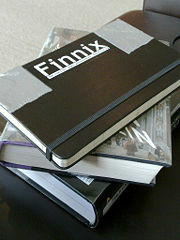 Both designs are high quality, screen-printed vinyl stickers. 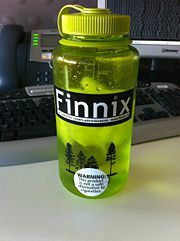 They're great for laptops, servers, water bottles, bikes, or anything else you can think of. 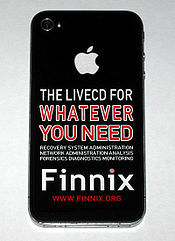 Monetary donations support Finnix, and with a donation of $10 or more, you'll get a few stickers. If you do not have access to US postage (or if you'd like to send trinkets anyway), send a self-addressed envelope plus one or more small trinkets to the above address. Make it personal! It doesn't have to be big or fancy, but consider something that represents you, your job, your town, etc. Received trinkets may be posted here in the future. This page was last edited on 19 January 2013, at 23:05.